Set and the contemporary temple that bears his name have always had a certain… something. From the outside, the Temple of Set seems to offer a considerably more interesting take on Satanism than the church from which it descended, returning enchantment to the sphere drained of glamour by LaVey’s materialism, carny aesthetics and entry-level libertinism. With that said, though, despite its birth in 1975, there has been disproportionately little publically produced in writing about the temple or their object of devotion in particular, with a few slim volumes from Don Webb being the only relevant contributions on the Scriptus Recensera shelves. Set: The Outsider may change that, with Webb describing it in the introduction as his religious text, standing in contrast to his previous books of straightforward self-empowerment. Set: The Outsider is divided into sections, rather than chapters (if one considers chapters to be segments in an ongoing, sequential narrative), and most of these are credited to either Judith Page, Don Webb, or both of them. There are also one-off contributions from Magister Xeperi.Tsh.Tsh, from former Temple of Set High Priestess Patricia Hardy, and returning from the grave with his 36 page lecture The Devil of Darkness in the Light of Evolution, that old, slightly disreputable, proto-antivaxer and favourite of Kenneth Grant, Gerald Massey. These sections are grouped into three broader parts that allow one to consider Set through archaeological, philosophical and practical lenses; though not necessarily everything fits into these unofficial categories. What becomes clear early on is that the contributions here are often self-contained little pockets, feeling in some cases as if they are articles that have been written for other publications and just recompiled for this publication. There’s nothing in the book that directly suggests this, but it explains the lack of an overall sequential narrative, why subjects seem to leap from one to the other, and why others seem piecemeal, unresolved or inconsistent in quality. This is particularly noticeable in the first section where, between various discussions of Set in terms of iconography and archaeology, attention suddenly turns to the 13th Dynasty pharaoh Hor Awibre, with a multiple page profile in which Set is not mentioned at all. Confusingly, this section is subtitled Setian Kings of the Second Intermediate Period, but only Hor is considered, rather than more obviously Set-affiliated pharaohs from that period such as Apepi, Seti I and Setnakht. While an anthology of previously printed work has some value from an archival perspective, when it’s not presented as such, a book like this can feel unsatisfying, when a little editing and more careful ordering of information could have made it more cohesive, and in so doing, more definitive. 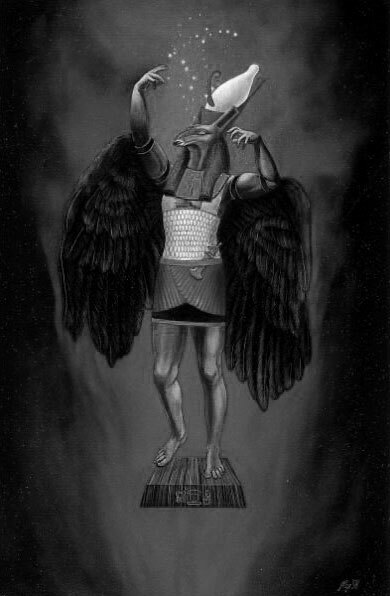 The contributions in the first part of Set: The Outsider discuss him in terms of parallels, such as the often synonymous god of oases Ash; his relationship with other gods like Horus; and through the iconography associated with him, including scorpions, griffins and of the course the ambiguous sha or Set-animal. Later, Magister Xeperi.Tsh.Tsh returns to this idea of Set as a griffin in far greater depth in an essay that was written as part of their initiation into the Temple of Set’s Order of Setne Khamuast. At thirty pages, Conversation with a Griffin stands in sharp contrast to some of the more fleeting contributions in this book, having all the things many of them lack: context, details, examples, structure and most importantly, references. Disappointingly, there’s not a lot of consistent citing of references within Set: The Outsider, with a general bibliography included in the back, but no specific listing of references, and very little in-text citations. This is particularly evident in the initial sections of the book where things are presented as indisputable fact and I’m just not sure that’s always the case. For example, in Set: Star~Child of Nut, Page talks of Set being identified with the star Sirius, an idea that seems to be solely the creation of Kenneth Grant (and not even one that has some hazy source in Massey’s otherwise well-thumbed works). This idea flies in the face of the established Egyptian identity of Sirius as the goddess Sopdet (perhaps more familiar by her Hellenised name of Sothis), and finding any evidence to the contrary is quite difficult. Given that this section is clearly drawn from Grant’s Cults of the Shadows, right down to some of the same points being made (including the glib but spurious idea that ‘in the olden days,’ the male role in reproduction wasn’t understood), a caveat saying “Grant claimed…” would have been a face-saving proviso that still allowed one to repeat the obviously appealing theory. While Grant is mentioned at the start of this section, there’s nothing to indicate that what follows is largely his highly unconventional take on Egyptology, rather than common and accepted knowledge. The other side of Set: The Outsider is a philosophical or theoretical one, and such contributions come predominantly from Webb, who writes very much in the voice of his Uncle Setnakh guise, all very informal, with jokey asides as one would expect given the avuncular designation. There’s a consideration of the word Xeper, while both Webb and Page provide personal histories, outlining how they came to Set, who he is, and lessons learned from working with him. The third and final part of Set: The Outsider is clearest in its intent, with a solid 140 pages focusing on the practical application of what has gone before it. 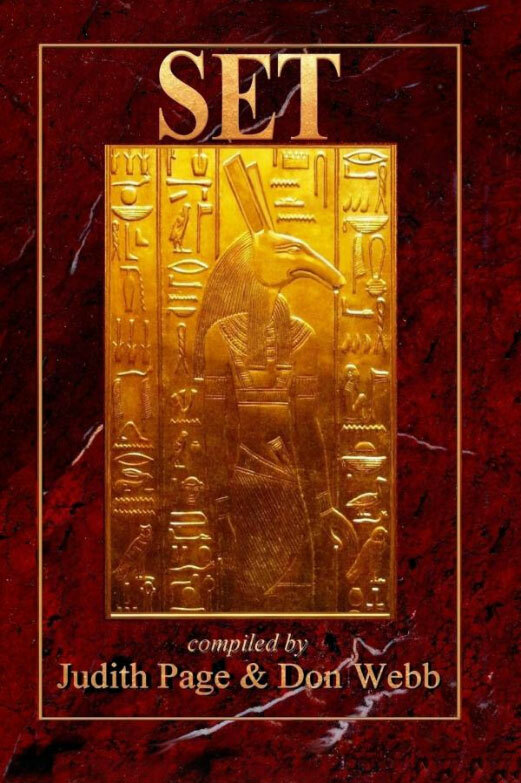 This takes the form of instructions on Setian magical work from Webb, and some basic ritual techniques, while Page presents several guided pathworkings in which the traveller visits various temples for Nuit, Set and Ptah. Page then concludes this part, and effectively the book, with a series of invocations and their instructions, addressed to Nuit, Set and Ptah, as well as Horus and Set together. Page provides both the cover design and layout for Set: The Outsider in a confident and competent style that is not without some issues. Body copy is set in Book Antiqua at 11.5 point, but could easily have dropped down a point, let alone that extra .5. As a result, the words fair jump off the page, almost in a shouting manner, and text rivers easily form any time a paragraph shrinks in width when text wraps around images. It’s also why the book reads a lot faster than one would expect of something with a page count of over 300, and a lot of trees could have been saved with a more sensible point size. Another issue with type are the headers, which are set within a black strip with a single uniform height, but here, in order to allow for any long chapter titles, the text has been artificially condensed, stretched vertically rather than using a true condensed face. The result is something that looks like a relic from the wild frontier of desktop publishing, when affordable PCs and ubiquitous software gave everyone the tools, if not the rules, of publishing. But, on the other hand, nowhere in the book is the typeface Papyrus used, nor does a background employ the writing material from which it takes its name, so that immediately gets Page some bonus points. In the end, Set: The Outsider has promise and it’s easy to see how a better book could have emerged with a little more editing and structure. All the content is there and it could so easily have been massaged into a more conventional structure, removing redundancies and better incorporating some of the more wide-ranging threads, to create an anthropologically and mythologically sound first half (overflowing with cited references, naturally), followed by a thorough practical second half. Review Soundtrack: Tapio Kotkavuori – Terra Hyperborea (Kotkavuori was a long time member of the Temple of Set, though there isn’t much obviously Setian in theme on this album.